Learn how to quickly add a smile to your subject, or improve an existing smile, with Photoshop and its easy-to-use Liquify filter! Exclusively for Photoshop CC. 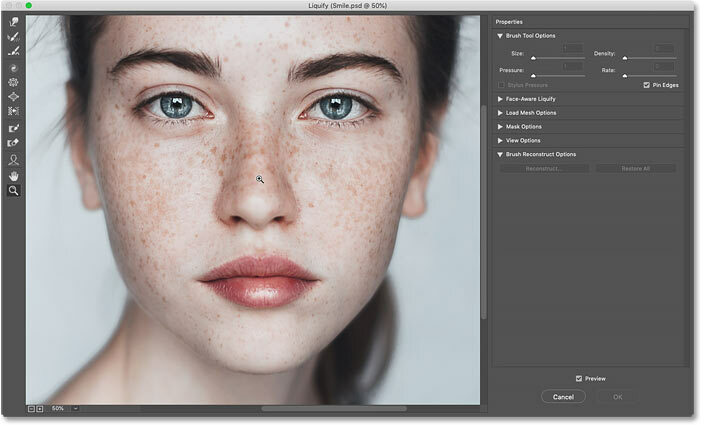 Back in 2016, Adobe added a powerful new feature to Photoshop's Liquify filter known as Face-Aware Liquify, which lets Photoshop automatically detect facial features in your image. And in this tutorial, I'll show you how to use Face-Aware Liquify, along with its Face Tool, to easily curve and reshape a person's mouth into a perfect smile! Of course, smiles don't exist on their own. 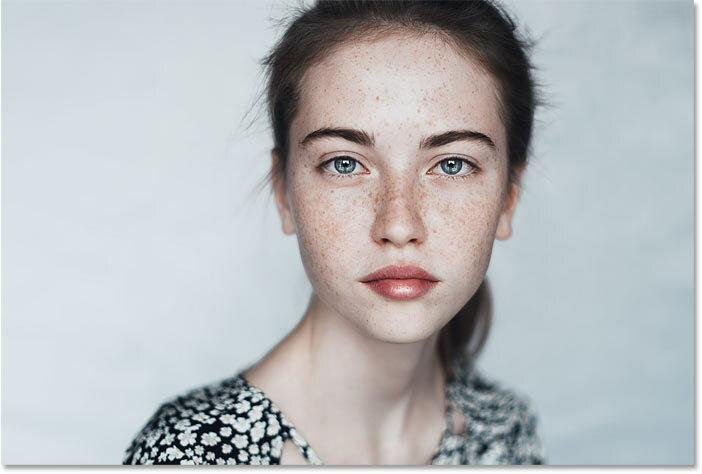 Other features, like the eyes and cheeks, also come into play. So along with adding a smile, I'll show you how to make the smile more realistic with a few simple adjustments to other facial features as well. If you're using Photoshop CC, you have your own reason to smile, since Face-Aware Liquify is only available in the most recent versions of Photoshop. Let's see how it works! We'll start by learning how to add the initial smile using a single, quick adjustment. And then I'll show you how to enhance the smile with some additional adjustments. To make our subject smile, we'll use Photoshop's Liquify filter. And the best way to use Liquify is to apply it as a smart filter. Smart filters are non-destructive, so we won't make any permanent changes to the image. And they're fully editable, so we can always go back and adjust our settings later. A smart object icon appears. 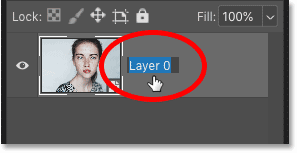 Step 2: Rename the smart object "Smile"
Notice that the name of the smart object has changed from "Background" to "Layer 0". Before we go any further, let's give it a more meaningful name. Double-clicking on the current name. Renaming the smart object "Smile". Zooming in on the image. With the Face Tool selected, move your mouse cursor over the person's mouth. Various icons will appear on the screen, each representing a different property of the mouth (Upper Lip, Lower Lip, Mouth Width, and so on). Hover your cursor over an icon to display a tool tip showing the property's name. Each property can be adjusted simply by clicking and dragging on its icon. Hovering the cursor over the Smile icon. Dragging upward to reshape the smile. 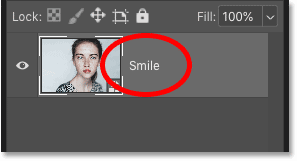 Dragging the Smile slider in the Properties panel. The result after adjusting the curve of the smile. To compare the new smile with the original, toggle the Preview option on and off by clicking inside its checkbox. You'll find the Preview option just above the OK and Cancel buttons in the bottom right of the dialog box. The original (left) and improved smile (right). If the smile looks good enough to you at this point, you could stop here. Just click OK to close the Liquify filter dialog box and you're done! But there are a few more things we can do to enhance the smile. One thing we can do is make the smile a bit wider. And we can do that using the Mouth Width slider in the Properties panel. 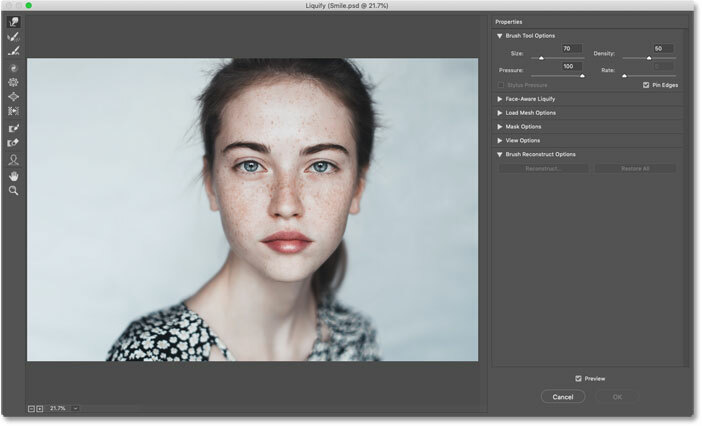 Keep an eye on your image in the preview area and begin dragging the slider to the right. As you drag, the sides of the mouth expand outward. Expanding the smile using the Mouth Width slider. The original (left) and slightly wider smile (right). 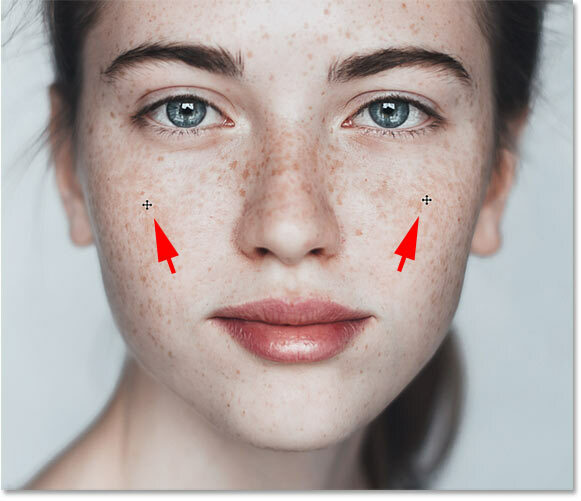 You can also adjust the thickness of the person's lips using the Upper Lip and Lower Lip sliders in the Properties panel. Note that these two sliders behave opposite to each other. 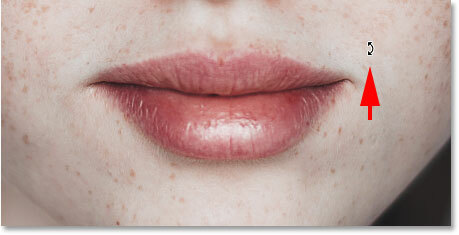 Dragging the Upper Lip slider to the left reduces the thickness of the top lip, and dragging to the right increases it. But the opposite is true with the Lower Lip slider. Dragging left increases the thickness while dragging to the right decreases it. The Upper Lip and Lower Lip sliders. 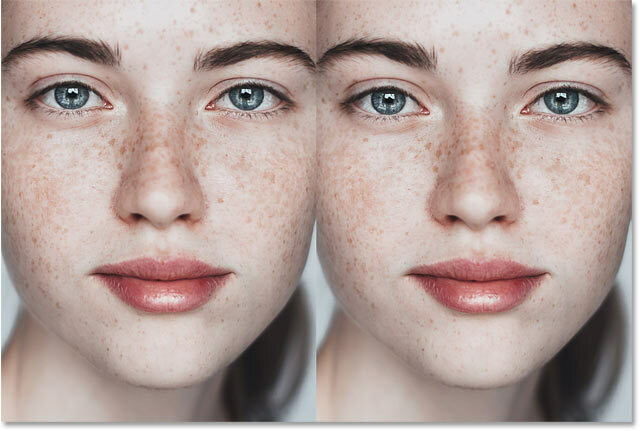 The original (left) and thinner lips (right). When we smile, it's not only our mouth that curves upward. Our cheeks also push upward. And just like we've done with the mouth, we can adjust the person's cheeks using the Liquify filter's Face Tool. 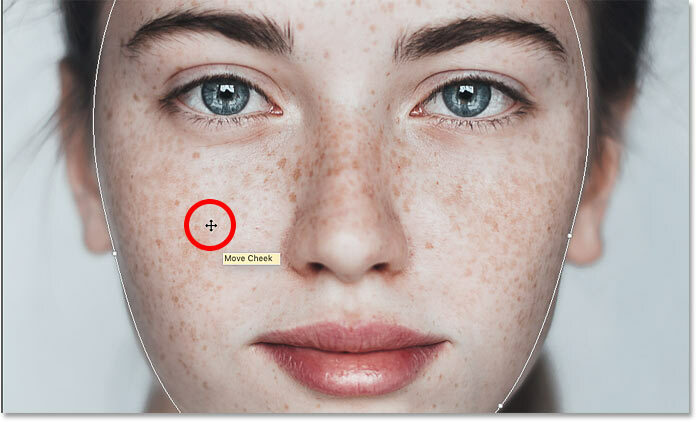 The cheeks can be adjusted only from within the preview area. Raising the cheeks upward for a more realistic smile. 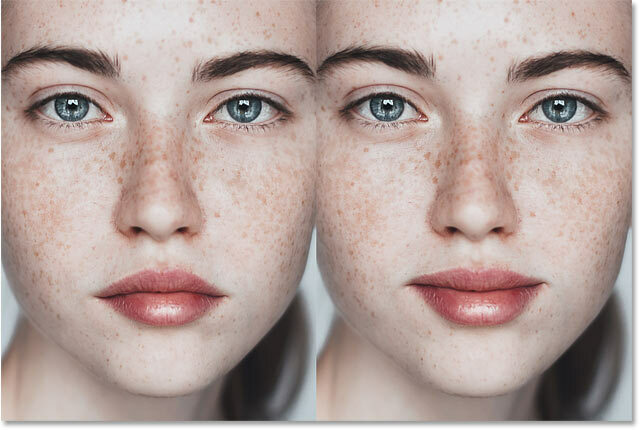 The original (left) and adjusted, raised cheeks (right). You may have noticed that by raising the cheeks, we also slightly raised the height of the eyes. 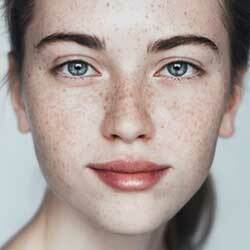 But generally, people tend to look friendlier and more relaxed with the eyes lower. So let's bring the eyes back down, and again, we can do that using the Face Tool. Like the cheeks, eye height can only be adjusted in the preview area. Then drag the eye down a short distance to its original location. You can even drag the eye a bit lower than its original height to give your subject a warmer, friendlier look. Press "P" on your keyboard to toggle the preview on and off so you can compare the original eye height with the new height. As always when making adjustments to facial features, subtle adjustments work best. Lowering the eyes back to, or slightly below, their original location. The previous (left) and lowered eye height (right). We'll start with the corner on the left. Position your brush cursor so that the corner of the mouth is roughly centered within the brush. Then change the size of the brush so that it's just large enough to include some of the surrounding area as well. Resize and center the brush over the left corner of the mouth. Reshaping the left corner of the mouth. Reshaping the right corner of the mouth. 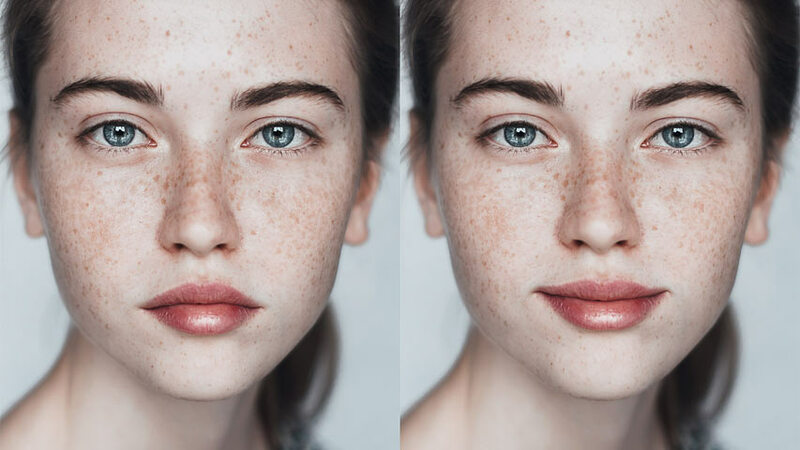 The original (left) and final result (right). 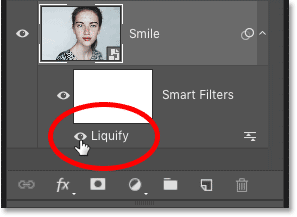 Back in the Layers panel, the Liquify filter is now listed as a smart filter below the "Smile" smart object. To toggle the filter on and off, click the visibility icon to the left of the filter's name. Turn the filter off to view the original smile, and then turn it back on to view the edited version. 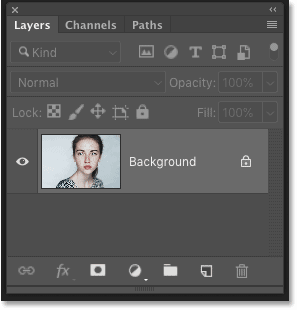 The Layers panel showing the Liquify smart filter. And there we have it! That's how to add a smile to your subject using the Liquify filter and its Face-Aware features in Photoshop! 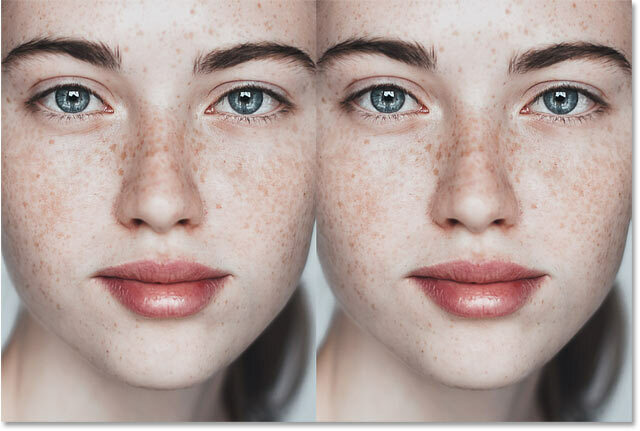 Check out our complete Face-Aware Liquify tutorial to learn more about this great feature. 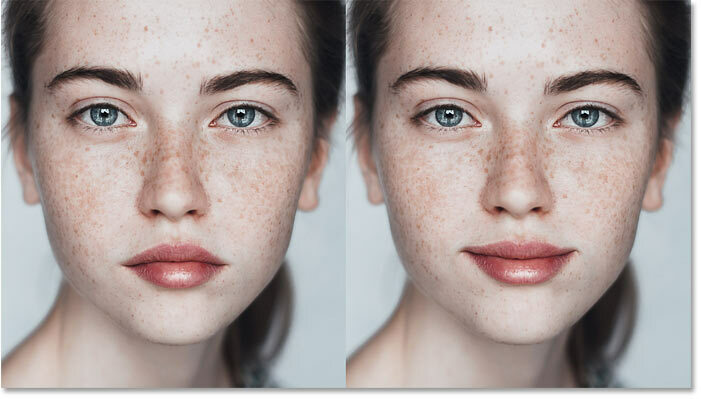 Or visit our Photo Editing section for more portrait retouching tutorials! And don't forget, all of our tutorials are now available to download as PDFs!